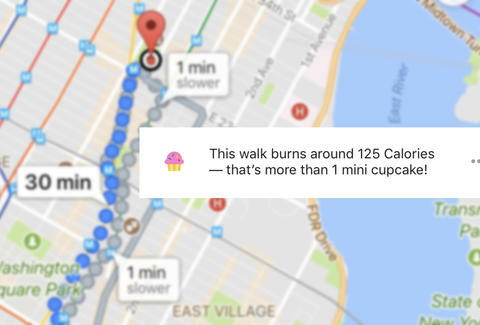 When Google Maps debuted a simple new feature this week that revealed how many calories you'd burn by walking instead of opting for other modes of transit, people were not amused. The backlash on Monday was swift, largely thanks to the fact that Google illustrated the burned calories with miniature cupcakes, an arbitrary metric that no one with an affinity for baked goods found amusing. Google's calorie-counting feature was briefly available as a test among iPhone users. The decision to roll out the feature seems particularly strange, considering useful health features that are baked into iOS that already track steps, exercise, and other health-related activity. CityMapper, another maps and directions app for iPhone, has a calorie-counting feature, although the app itself is nowhere near as ubiquitous as Google Maps and doesn't associate walking with confectionary snacks. The company's insensitivity to body image issues were chief among user complaints, as the distance to cupcake ratio -- one mini cupcake equals 110 calories, according to Google -- wasn't viewed as productive or motivating. Google has since pulled the new feature in response to the backlash, meaning Google Maps is again cupcake-free, as it has been for the majority of its existence. Google's reason for deactivating the function was "based on strong user feedback," a company spokesperson told TechCrunch. Given the almost universal condemnation, you probably won't have to worry about your Maps app prodding you about losing weight or mentioning cupcakes ever again.